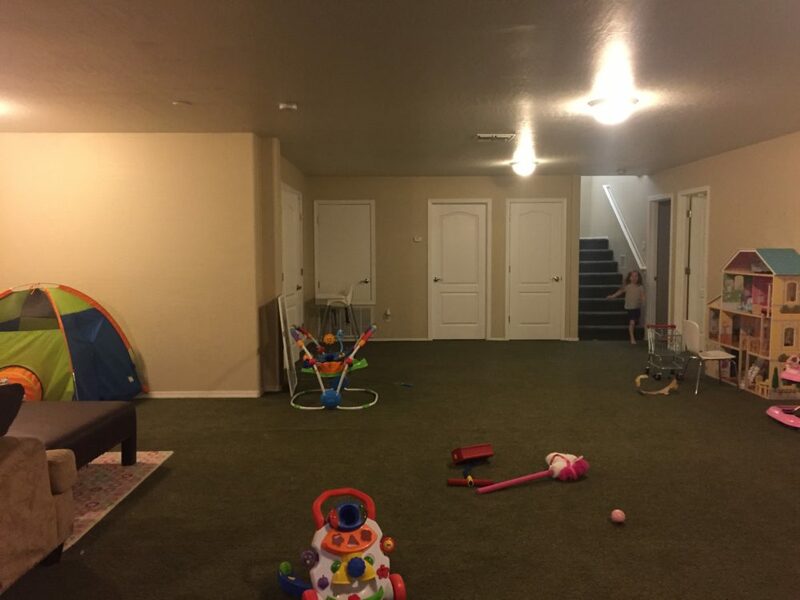 One of the biggest selling points of this house for us was the basement. 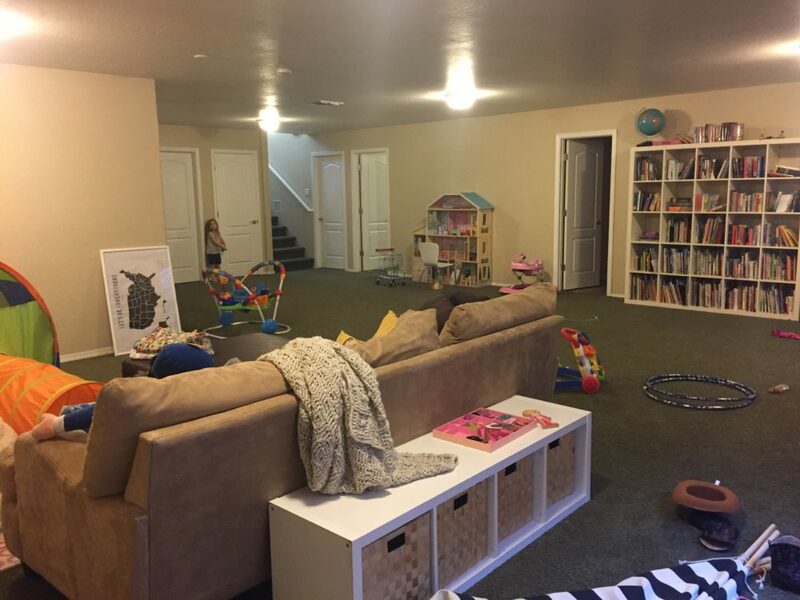 It has a really big living space downstairs, with tons of room for the girls to play and our family to hang out, plus because it’s a basement, it stays a little cooler than the rest of the house. Of course, then we moved in and we just didn’t really use the basement. We didn’t have any real furniture down there for more than a year, which meant that hanging out down there wasn’t very fun unless you enjoyed lying on the floor. 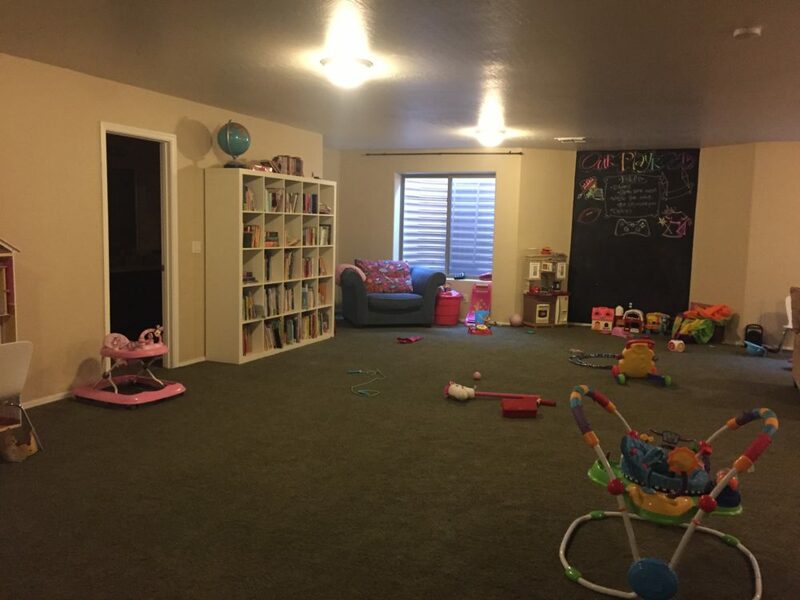 Last winter, we moved our living room couch down to our basement, which made it more usable, but it was still a pretty big eyesore with beige walls and green carpet and just a mishmash of furniture and toys. 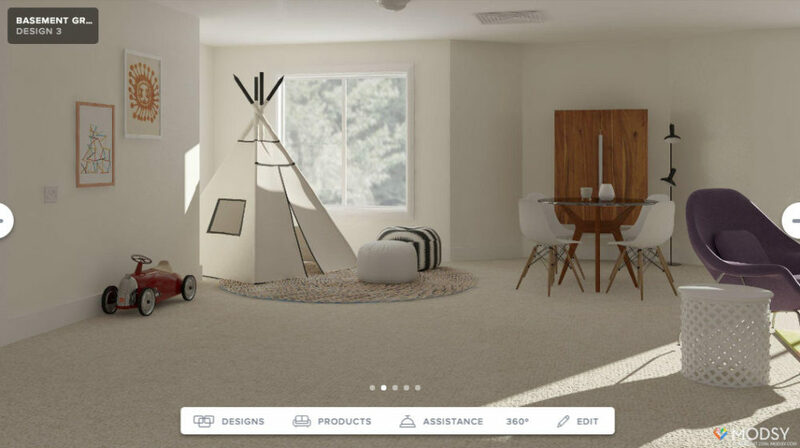 I’d used a design service for our master bedroom and loved how it turned out, so this summer, I started toying with the idea of using one for our basement. But because the space was so big, I wanted more than just a mood board – I wanted a basement design that would let me see how things would really look in the space. 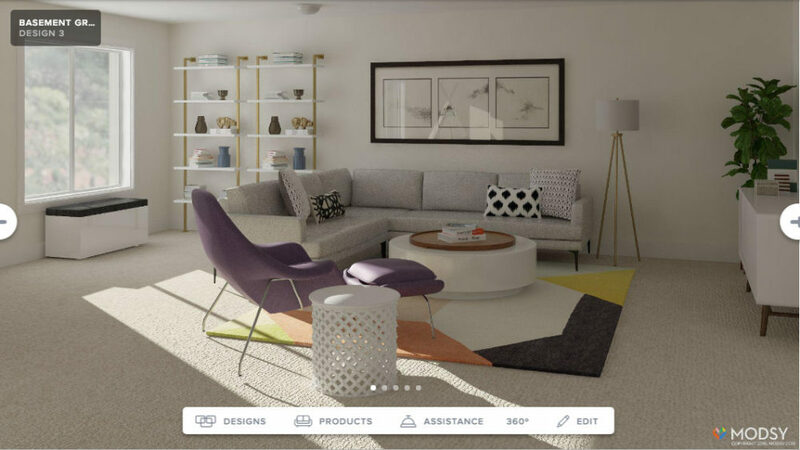 Then one morning when I was listening to Young House Love has a Podcast while I was running, I heard an ad for Modsy, which does home designs with 3D renderings. I came home and discovered that a room design cost $69. And there was a 20% off coupon, so it was $55. I couldn’t buy it quickly enough. 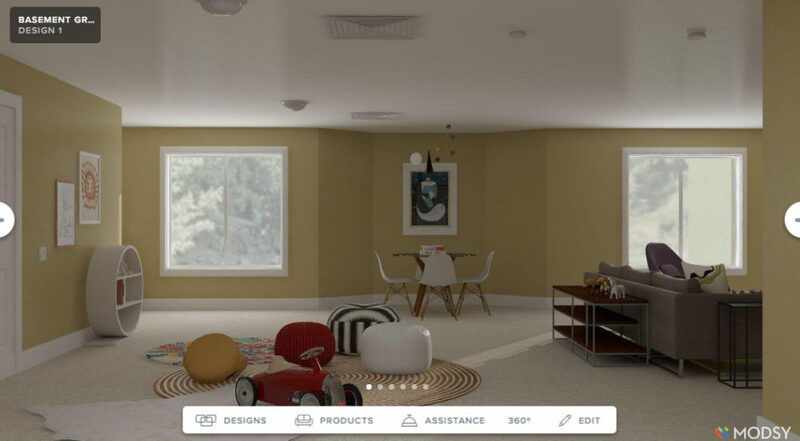 You can choose what room you’re doing (bedroom, living room, kitchen, etc) and then what your project is like. Are you moving, re-arranging, moving in with someone? Then you give your budget and if you’re starting from scratch, adding mostly new pieces, or working with all pieces you already own. Next they have a really good style quiz, which really helps you identify not only your style, but what kinds of pieces you like. Sometimes you like a room, but then the designer doesn’t recognize WHY you like that room. Is it the paint color? The couch? The wall art? I filled out my style quiz (which was really fun) and a few days later, I pulled out my measuring tape and added my measurements, then snapped a few photos with my phone so they could see the whole room from each corner. Happily, they said you didn’t have to clean up the room before you took photos which was good because I would have probably NEVER gotten around to it. Here are those photos. Don’t judge. I hoped my terrible photography wasn’t going to ruin my mock-ups. 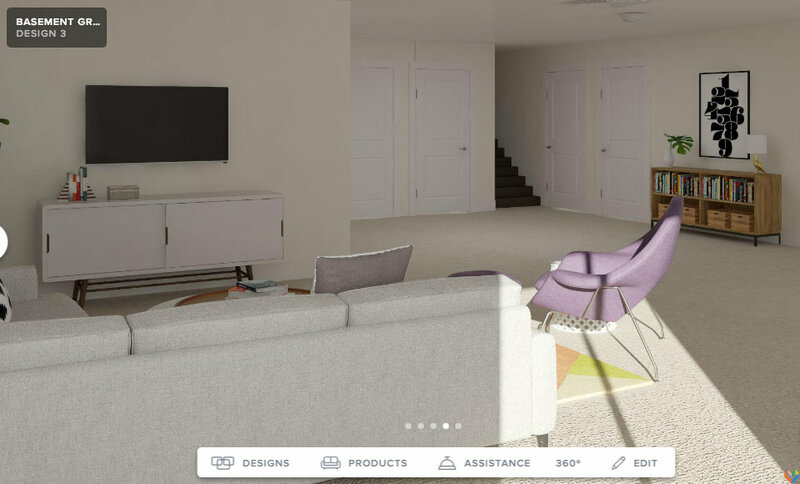 When the first renders for our basement design came back, I was seriously just staring at my computer screen with my mouth hanging open. 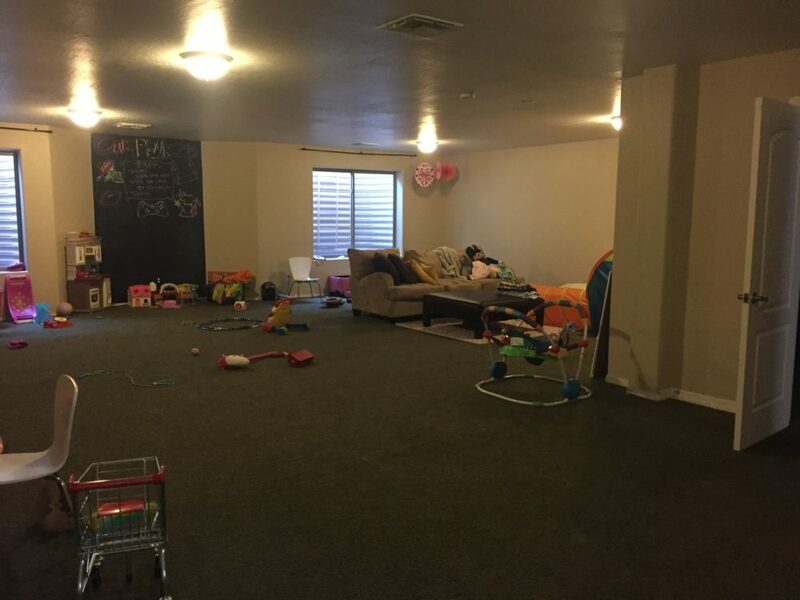 It was so insane to see our basement looking exactly like our basement. Except not ugly. You get two full custom designs and then unlimited revisions (woot!). This one below was one of my first designs and they’d kept the original paint color of the room, which I knew I wanted to change and so I asked them to re-do it with Sherwin-Williams’ Alabaster, which is what you see above. I think you can only change the paint color once for free, but it was amazing to see how much the room changed with white walls instead of tan. And they were quick to rearrange things, offer other suggestions, or swap in different pieces. 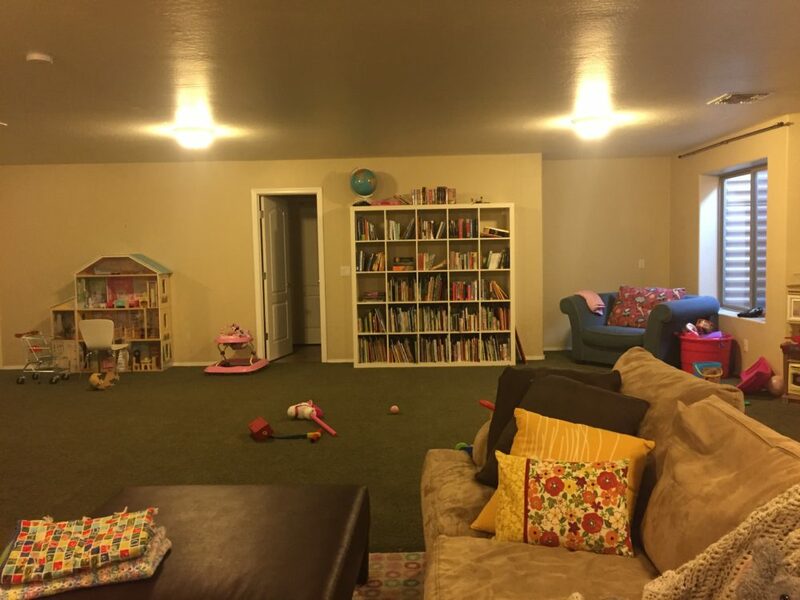 This basement has been so frustrating to me for the past two years because I knew it had a lot of potential but I just didn’t have the design skills to figure out how to make it really a beautiful, useful space for our family. Once I had these Modsy designs in hand, I felt like I was finally ready to move forward. My mom came down this week and we painted the entire basement (hooray!) and hopefully the carpet will get replaced in the next couple of weeks and then the fun of actually finishing the room begins. I cannot wait to have this space looking better – I’ll show you how it turns out next month! And if you’re interested in a design with Modsy (which I can’t recommend highly enough), you can use the code EVERYDAY20 for 20% off. Also, if you have questions about the whole process, leave a comment and I’ll try to answer as fully as I can! This is so amazing! 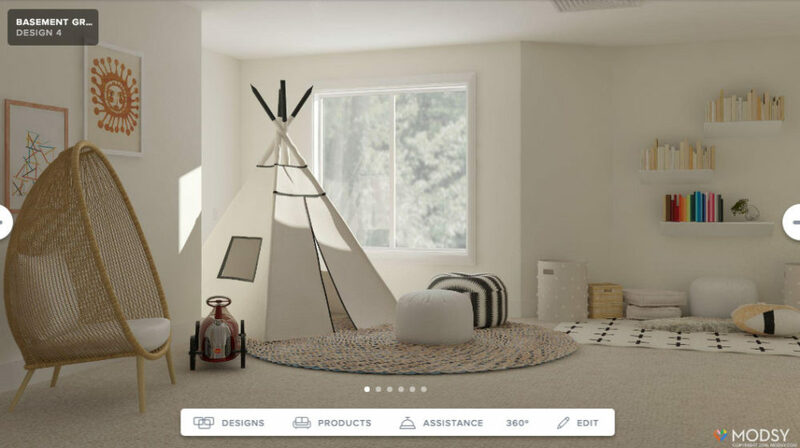 Thank you for sharing; we’ve been stuck with our living room/dining room for the longest time and it’s so helpful to have an affordable design service that can do this. Amazing! I can’t believe how amazing those renderings are! It looks like they’re REALLY in your house! I so want to do this with our kids bedrooms because they’re literally the only spaces in the house that I can NEVER figure out how I want. Seriously so amazing. I need some help in my little house. Did you paint all your ceilings with Alabaster also? No, we just left them the color they were – it’s pretty close to Alabaster so we just free-handed the top edge. If you have existing furniture that you would still like in the space will they design for that? Also, do they give you recommendations on where to buy the products they put in the design. This turned out amazing! I can’t wait to see the finished product! Yes! I think it’s $10 per item that you want to keep to have it digitzed and added to the space. And yes, they give you the source and price for every item in your design!